LAWPRO recognizes that the Government of Ontario supports the full inclusion of persons with disabilities as set out in the Ontario Human Rights Code (the “Code”), and the Accessibility for Ontarians with Disabilities Act, 2005 (the “AODA”). It is the goal of the Ontario government to make Ontario accessible by 2025. LAWPRO’s Accessibility Policy is consistent with the AODA and the Code. LAWPRO is committed to providing our services in a way that respects the dignity and independence of persons with disabilities. We are also committed to preventing, identifying and removing barriers that impede the ability of people with disabilities to access our goods and services. These commitments will be integrated wherever reasonably possible and will ensure that persons with disabilities will benefit from the same services, in the same place and in a similar way as other customers. LAWPRO is committed to ensuring that every employee and customer receives equitable treatment with respect to employment and services, without discrimination, and receives accommodation where required, in accordance with the provisions of the Code and the AODA and its Regulations. LAWPRO will meet the accessibility needs of persons with disabilities in a timely manner. This policy applies to all individuals entitled to the protections set out in the AODA and its Regulations, including customers and employees of LAWPRO. Where required, LAWPRO will consult with the disabled individual to understand their specific accessibility needs, and then make all reasonable efforts to meet those individual needs in a timely manner. In conjunction with the above and as per the requirements set in regulations under the AODA, LAWPRO will, upon request, consult with the disabled individual to understand their specific accessibility needs in order to determine the suitability of particular accessible formats and/or communication supports. LAWPRO will then provide or arrange for the provision of appropriate accessible formats and/or communication supports in order to meet those individual needs in a timely manner, subject to exceptions by regulation. 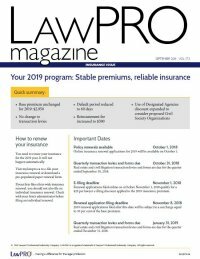 This policy, related policies and the Multi-Year Accessibility Plan outline LAWPRO’s strategies and actions to prevent and remove barriers to accessibility and to meet the requirements under the AODA and its Regulations. All of the aforementioned documents will be made available in accessible formats upon request. In order to ensure that existing processes for receiving and responding to feedback are accessible to persons with disabilities, LAWPRO will provide or arrange for the provision of accessible formats and communication supports, upon request.